The best strategy for pipeline owner operators to protect themselves against these quality risks is to implement a thorough quality management system (QMS), as laid out in API Recommended Practice 1177. The key to any successful QMS is the real-time collection of, access to, and analysis of pipeline data. To that end, many pipeline professionals have been adopting the use of ‘Smart Forms/PDFs’ to capture and manage their data. While this technology has some benefits, it is woefully insufficient for the standards of a QMS set forth by RP 1177. The manpower and finances required to locate, extract and utilise information for quality management, engineering assessments, and incident investigations result in significant delays. There are much more advanced technologies available today for the purposes of quality management. Namely: 4th Generation (4Gen) technology. What is 4Gen technology for pipelines? 4Gen technology refers to the implementation of automated tools and machines to a system that can analyse the process chain, make recommendations, flag errors and report on user-defined analytics and objectives. In the pipeline construction and operation industries, 4Gen technology primarily serves as a construction QMS. How does 4Gen differ from Smart Forms/PDFs? Smart Forms/PDFs are essentially just that – ‘smart’ versions of PDF documentation. They give the user the ability to edit a pdf file with the same freedom as a spreadsheet, word, text or jpeg file, while providing security and the ability to confidentially access searchable file content. The ability to be modelled after the forms and templates used by the owner-operator or construction contractor. A secure digital system that allows for data and document editing, commenting, recommendations and sign-off rights, providing traceability and accountability by the User(s). All data entered is stored on the PDF. In order to efficiently audit the data, time consuming filtering is required. Even then it must also be analysed against a KPI to measure completeness or compliance with the project. 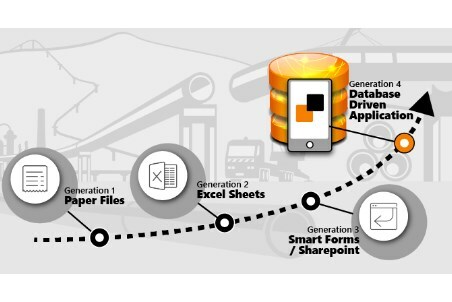 Due to the large amount of specifications used for pipeline construction, any smart form or pdf would require a timely and complex configuration process to capture all data. In contrast, 4Gen technology can automate all of the tedious data capture, storage, retention, filtering, and analysis while users are actively working in the field. In fact, 4Gen software tools exist that can singularly house all data and information issued during the planning, design and verification, contract, materials requisitioning and construction phases of a pipeline project. Essentially, these tools create a pipeline ‘Digital Twin’ – digitising every phase of the pipeline lifecycle on a secured cloud server with the client given proprietary access rights. Utilising a cloud-based server to access, store, and revise data as needed, the user has the ability to monitor progress, identify construction quality issues and audit the construction phase on a daily basis. This leads to actionable intelligence for management to identify shortcomings and create improvements in near real-time. In addition, as revisions to construction and quality standards are issued, they can be automatically downloaded to the device. Whenever construction specifications are revised, the device will automatically update in the field. This results in construction crews remaining proactive in capturing construction errors and exhibiting due diligence. Construction management will receive confident reports from the field regarding pipeline spread progress, construction NCRs, and scheduling. Construction progress can be recorded and uploaded via web-connectivity to project managers and inspectors, reporting on completeness and compliance. The work required to process data and issue reports with 4Gen technology can be completed without the initial step of separation and cleanup of raw data, requiring fewer man hours to obtain the same result with smart PDFs. Forms and templates used come complete with the material requisitions, weld procedures, spool numbers, routing, right of way, etc. – allowing traceability of data during the construction phase. A user can tailor the data and reporting requirements to suit their needs and objectives during the construction phase while still collecting all data within a secure system. Reports can be completed at the end of every day shift, signed off, and issued as a pdf report to the document control personnel of the owner-operator. Project close-out and document hand-over used to involve weeks of gathering hard copy PDFs, approved reports and inspection results. Now the close-out can be completed, issued to the owner-operator on a USB stick, and can be measured in a manner of minutes. At the end of the day, PDFs cannot communicate with each other. If data from multiple sources needs to be analysed and measured, timely work to filter and collect the data is necessary. On the flip side, with the right 4Gen pipeline software, quality and compliance metrics across multiple disciplines and actions can be analysed in real-time as data is entered. Document hand-over and project close-out is no longer a process of collecting hard copy documents from multiple sources. As all data is entered and verified by the end-user, the owner operator can be confident that quality and regulatory standards have been achieved based on measured results from the field. Through repetitive audits from the data collected and analysed, continuous improvement of construction quality can be achieved, and instances of weld repairs/pipeline leaks can be dramatically reduced. All before the current project ever goes into service! Current mindsets associate lessons learned with these changes being applied to the NEXT project. Real-time learnings using 4Gen can be developed fast enough to affect the safety and reliability of the project that it is currently being used on. Metegrity is a global leader in quality and asset integrity management for pipelines. Its Pipeline Enterprise product is a 4Gen QMS software tool that helps owner operators digitalise all phases of the pipeline lifecycle for maximised efficiency gains and rapid improvements to profitability. Metegrity currently protects over $550 billion in assets across 850 facilities worldwide. 1. NIESEN, V. and GOULD, M. (2017, November). Detecting Pipeline Leaks. ASME Mechanical Engineering, 139 (11), pp 35-39.